In early December we made a second strategy for trading VXX and XIV available to our subscribers: the Volatility Risk Premium (VRP) strategy. You may remember me outlining the excellent performance of this strategy in my previous blog post, Volatility Strategies - Separating Fact From Fiction. I liked the strategy so much I decided to make a few adjustments and launch our own version of VRP to use along with our VXX Bias on our Daily Forecast page. Why use two strategies for trading volatility ETPs? Because no single strategy is perfect and the market is inherently unpredictable. Using two complementary strategies simultaneously compensates for inherent weaknesses within each of the strategies, reduces drawdowns, and smooths out returns over months and years. 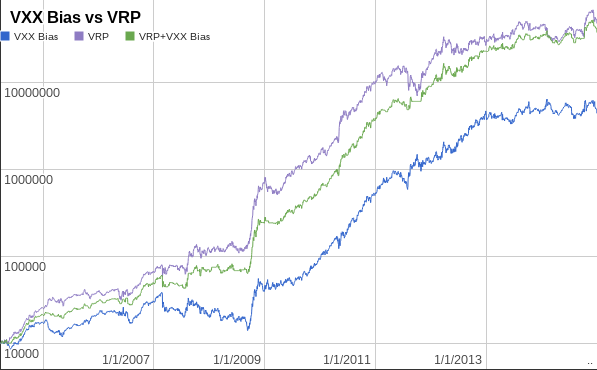 The VXX Bias and VRP strategies each take a very different approach for maximizing gains. 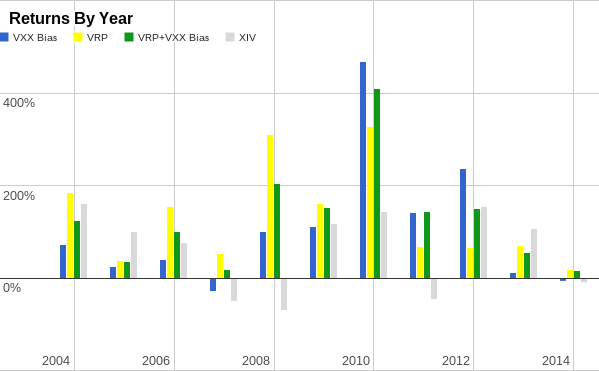 The VXX Bias strategy is based on the term structure and momentum of VIX futures, while VRP is based on the price of VIX and historical volatility measurements. However, each of these strategies thrive and struggle depending on the specific market conditions. For example, the VXX Bias strategy has an advantage in handling periods of moderate drawdowns and sustained periods of backwardation. Meanwhile, the VRP strategy tends to be better with choppy markets and periods of gradually increasing volatility when VIX futures are in contango. 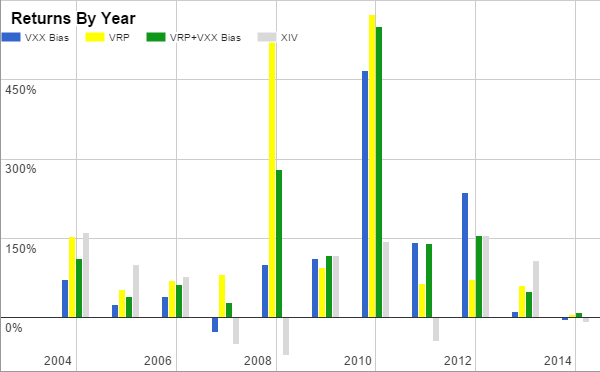 You can see in the backtest results below that neither strategy consistently outperforms the other over a given year, although both VXX Bias and VRP are vastly superior to a buy-and-hold approach with XIV. 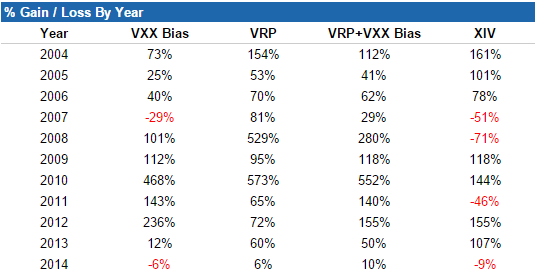 Looking at the strategy statistics below, we see that the VRP + VXX Bias strategy benefits from a reduced maximum drawdown and a 0.90 Sharpe Ratio. Full test data for both the VRP and VXX Bias strategies can be found in the spreadsheets at the bottom of the Subscribe page. You can also read more about our trading strategy on our Strategy page. Access to our daily indicators and automated alerts for both the VRP and VXX Bias strategies is available via subscription to Trading Volatility+.